Visualization is often used in situations where data analysis algorithms for the detection of features in scientific data are too limited or do not even exist. It exploits the researcher's visual acuity, cognitive abilities, expertise and experience in recognizing patterns. One of its application areas is computer simulation. Simulation results are often represented by abstract mathematical structures, and visualization is used to convert these into pictures. At the core of every simulation is a mathematical model that is evaluated by a computer. Invariably, a computer simulation model is defined by a number of parameters that control the behaviour of the simulation, and which are therefore of crucial importance to the model developer and the end-user of the model. Awareness of a model's behaviour is greatly enhanced when a researcher is given the ability to control a simulation by interactively manipulating the models parameters. Such an interactive system aids in exploring the behaviour of a simulation because parameter changes are immediately visible. This provides a feedback-response mechanism allowing a researcher to use the visualization to plan a response. In the EU-funded project 'Advancing Clinico-Genomic Trials (ACGT) on Cancer', researchers collaborate to combine interactive visualization, virtual reality technology and in-silico tumour growth simulations into an interactive environment. This can be used to explore simulated predictions of tumour growth and treatment response. The architecture constructed in ACGT consists of a Grid-based distributed computing and software framework. It allows in-silico tumour simulation models, interactive visualization methods and other data sources to be combined into an interactive visual exploration environment. Figure 1: The Personal Space Station (PSS) offers stereoscopic visualization and direct interaction by means of tracked objects. Picture: UvA. In-silico tumour simulation models combine tumour information obtained from medical imaging techniques (CT, MRI, PET and ultrasound) with mathematical models that predict the growth of tumours or the response to chemotherapy or radiation therapy. The simulation models produce spatiotemporal predictions of the composition and morphology (form) of the tumour over the course of time. These predictions provide clinicians with valuable information on the most effective treatment out of several alternatives, as well as detailed parameters on the optimal composition of a treatment scheme, including the total treatment period, the type of drug(s), dose, and interval between treatments. A treatment is defined by several parameters; each of these has a range of possible values, and is influenced by the others. When a new clinical trial is defined, simulation models help to define the initial parameters that predict the treatment most likely to be most effective. Tumour growth simulation results are used in different ways. Each scenario has different visualization and interaction requirements, which sometimes call for unconventional graphical displays to effectively assist researchers to achieve their goals. 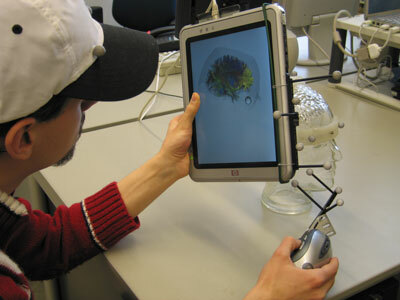 Researchers at UvA and SARA have designed a Highly Interactive Framework for Interactive Visual Exploration (HIFIVE); this abstracts interactive visualization applications from graphical displays and user interfaces, so that they can be used on many types of graphical displays, each with their own set of user interfaces. This allows interactive visual exploration applications to be used in a wide variety of scenarios. For example, finding the optimal combination of parameters for a certain treatment is difficult. As no analytical method exists for finding this optimum, the ACGT environment is used to perform a large number of simulations for combinations of parameters that are thought to be most successful. The results of these simulations are presented in a stereoscopic visualization environment called the Personal Space Station (PSS), developed by Personal Space Technologies in the Netherlands. The PSS represents the simulation results in 4D (3D + time) and allows a researcher to "reach in" and explore the visualized results hands-on, simply by manipulating optically tracked handheld objects. The combination of 4D visualization with intuitive interaction methods allows researchers to explore the different outcomes and make adjustments to optimize treatment parameters. Patient-specific treatments are optimized with the help of an interactive handheld display. It combines simulation results with information obtained from additional medical image sources, including anatomical scans (CT, MRI, ultrasound), functional scans (fMRI, PET) and advanced imaging techniques such as Diffusion-Weighted Imaging (DWI). Combined with tractography, they are used to infer the connectivity of the brain. Through the simultaneous visualization of simulation results and medical images, this co-located tracked display provides surgeons with a powerful planning and navigational tool that can be used in the case of surgical treatment, such as tumour resection. Overall, the combination of the ACGT Grid infrastructure with the HIFIVE framework provides a unique distributed computing architecture that offers support for high-performance and responsive interactive simulation and visualization applications. 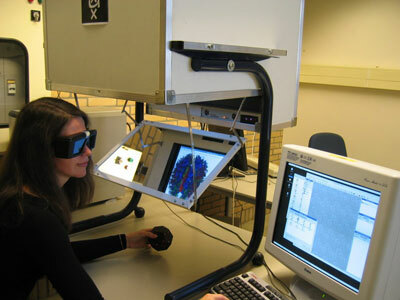 Part of this work was carried out in the context of the Virtual Laboratory for e-Science project (www.vl-e.nl). This project is supported by a BSIK grant from the Dutch Ministry of Education, Culture and Science (OC&W) and is part of the ICT innovation programme of the Ministry of Economic Affairs (EZ).